The eighth full-length adventure of the blonde bombshell is now available for your ereader! 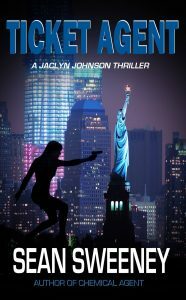 In Ticket Agent: A Thriller, Jaclyn and Tom go up against an international business tycoon with his fingers in several different entities in both the United States and the United Kingdom. It is when he separates the pair to perform their investigations where they discover the awful truth of the situation: he has Tom under his crosshairs! Ticket Agent: A Thriller is now available for your Kindle (US/UK), your Nook, your Kobo, or for your Apple device via iBooks.